You’ll have to excuse me for this blog post. It slightly pains me to post it if I am being honest as the photographs are all wrong…in the sense that I took them in the evening with no light. This is a major no no for food photographs and normally I always shoot in daylight but for this post I could not reheat the dish and as much as I love scallops I really did not want to eat them for lunch and supper. So please overlook these dark shots and believe me when I tell you this is a seriously quick, tasty and stylish dish that is guaranteed to please anyone you present it to. Fresh scallops are wonderful, but I sometimes buy frozen from my local fishmonger and they work pretty well and are relatively good value. I am also a HUGE fan of black garlic. I wrote an article about black garlic for Country and Townhouse Magazine which you can read here. It will tell you all about them so have a peek at the article. Black garlic is beginning to pop up in some supermarkets but I sometimes just order it directly from either The Garlic Farm, Merchant Gourmet or The South West Garlic Farm. Some people are squeamish about black pudding, but please people seriously there is nothing to get worked up about, unless you are vegetarian/vegan then I apologise. The fact is the saltiness from the black pudding works brilliantly with the scallops and the black garlic adds a umami (I wrote an article about this too – read here) sweetness that bursts in a flavour explosion in your mouth. I have added a balsamic jus to bind it all together and then added little quenelles (oval shape mounds of food) of pea and mint puree. The colours and flavours are magical. I think it probably works best as a starter or you could just add a few more scallops and black pudding to turn it into a main. 1. First place the oil in a frying pan and when it is hot add the black pudding slices and cook on both sides for a couple of minutes, by which time they will have darkened in colour and crisped up slightly. Set aside in a warm place. 2. In a separate pan boil the peas and add the mint to infuse. After 5 minutes, drain and then puree using a blender. You can add a little chicken stock at this stage if you want a smoother more runny puree. Set aside in a warm place. 3. Using the pan that you cooked the black pudding heat the butter. Once it is melted and hot, but not burnt, add the scallops and gently heat for max 2 minutes on each side, so that a slight bronzing occurs on both sides. Add the black garlic once you have cooked one side of the scallops and then add the balsamic jus just before you take the scallops out of the pan. 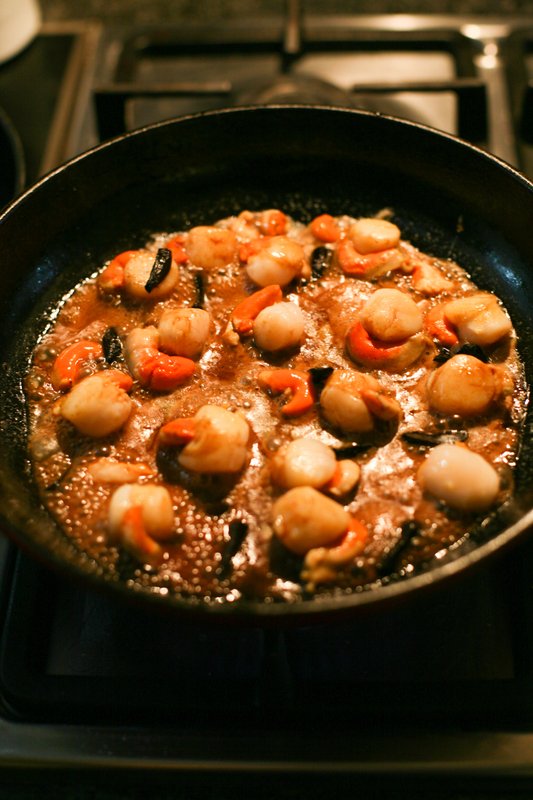 Ladle the balsamic jus over the scallops and then place them on a warm plate. 3. Raise the temperature slightly and add the boiling water if you want more of a jus and boil for a few minutes so the jus reduces and thickens slightly. 4. To plate up (use pre-warmed plates) add the black pudding followed by the scallop and then the black garlic. 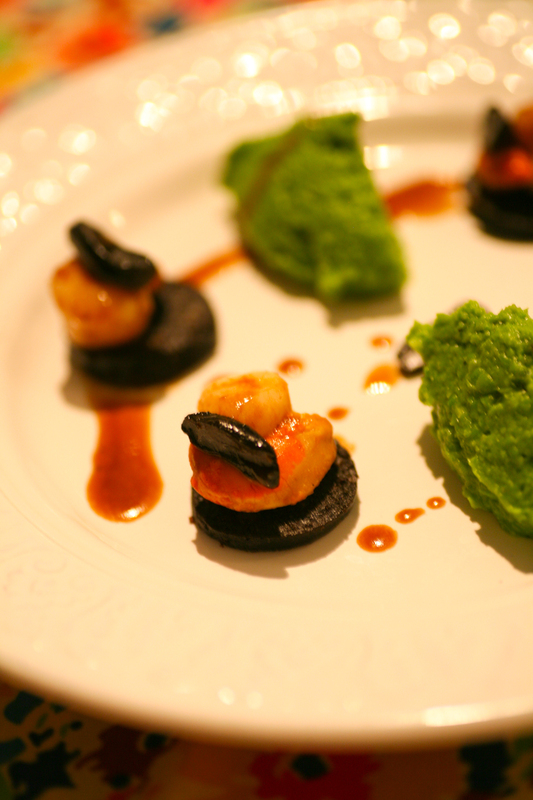 Next create quenelles with the pea and mint puree. They are easy to do. Watch the quick video below to show you how to do them. 5. Finally pour the jus over the scallops and around the plate. Serve immediately so that it is still hot. 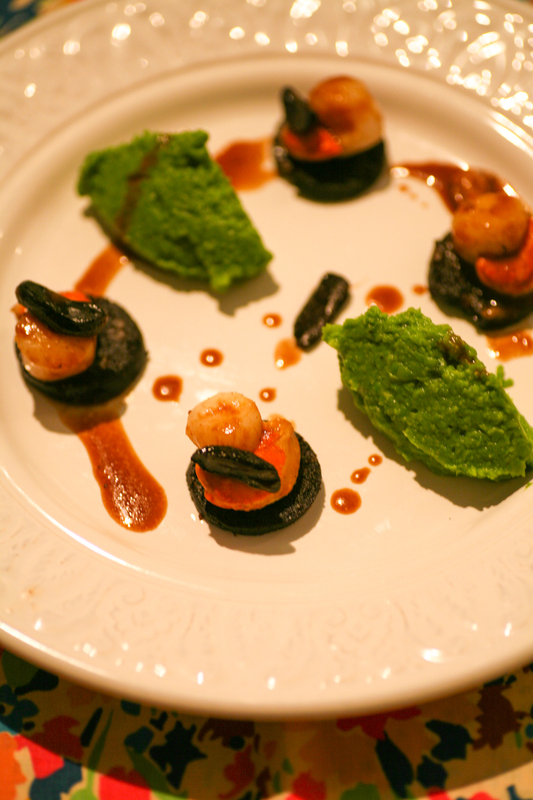 This entry was posted in Shellfish and tagged balsamic vinegar, black garlic, black pudding, pea and mint puree, scallops. Bookmark the permalink.